So what’s wrong with this picture! 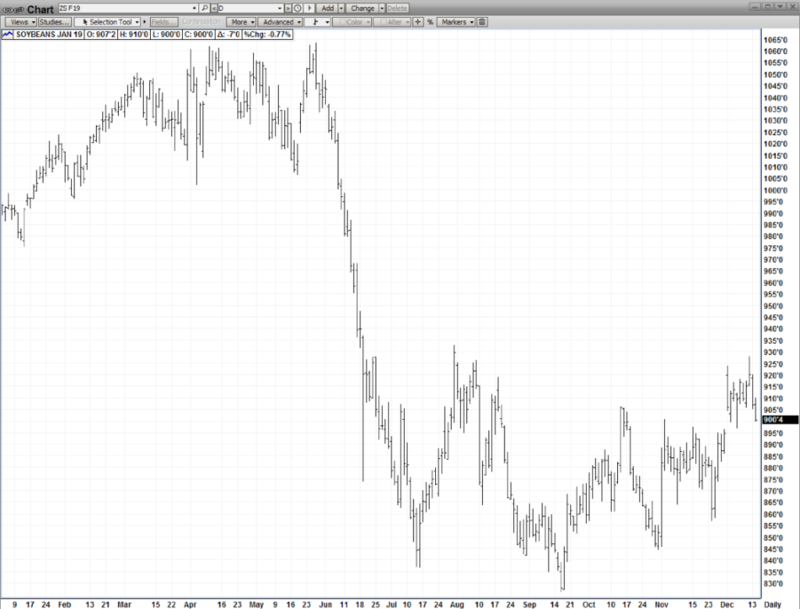 Finally, after a long trade stalemate, China has started buying beans again this week! But the mkt still closes with a 16 cent weekly loss! It’s simply a case of BUY-THE-FACT/SELL-THE-RUMOR it is! Large exports were expected but the actual #’s disappointed, coupled with Chinese economic slowness – both stunned the mkt. DEC USDA SUPPLY & DEMAND 12/11 – this is normally a non-event being in the midst of the “holiday mkts” with no update on production & yield until the final #’s in Jan 2019 –but with a trade deal brewing, this report garnered special attention – and the numbers were slightly negative – but the mkt was able to shrug them off – closing higher! ARE EXPORTS A GOOD THING? You wouldn’t know it by looking at the mkt action this week! FINALLY, the Chinese start buying again and the mkt closes lower anyway! 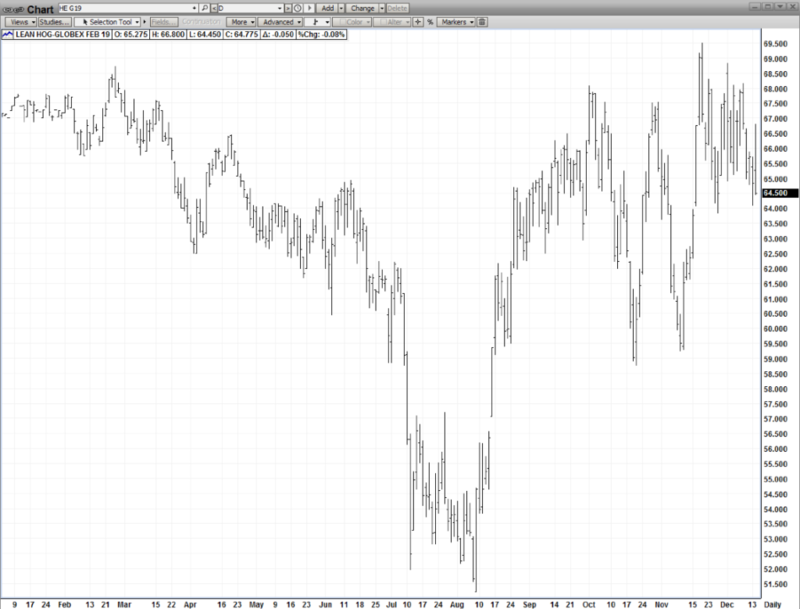 What happened was the mkt got caught up in a “but the rumor- sell the fact” mentality. Plus, it was disappointed in the actual quantities reported – Finally, since Nov 23, Jan Beans have rallied 70 cents (855-925) – so a lot of the good news was already built in! CHINA’S SLOW ECONOMIC GROWTH– in front of Friday’s opening, stats were reported – highlighting China’s slowing economic growth – that spilled into our stock mkt – which lost 500 points & our US Dollar gained 36 points in a “flight to quality” – & both negatively impacted all commodities – crude oil also took a hit losing $1.36. SOUTH AMERICA – possibly lost in the shuffle amidst all the “trade rhetoric” is planting progress in SA –which is going well – with Brazil 96% complete (ly – 95) as of 12/6! But some dry conditions exist in Panana & Mato Gross! RECORD WORLD ENDING STOCKS –are pegged at 115.3 (ly-101) & certainly weigh heavily on the mkt but the mkt has been trading on this metric for some time – and a trade resolution should be a good start at whittling these down! Trade progress is good start! Much more encouraging than recently! 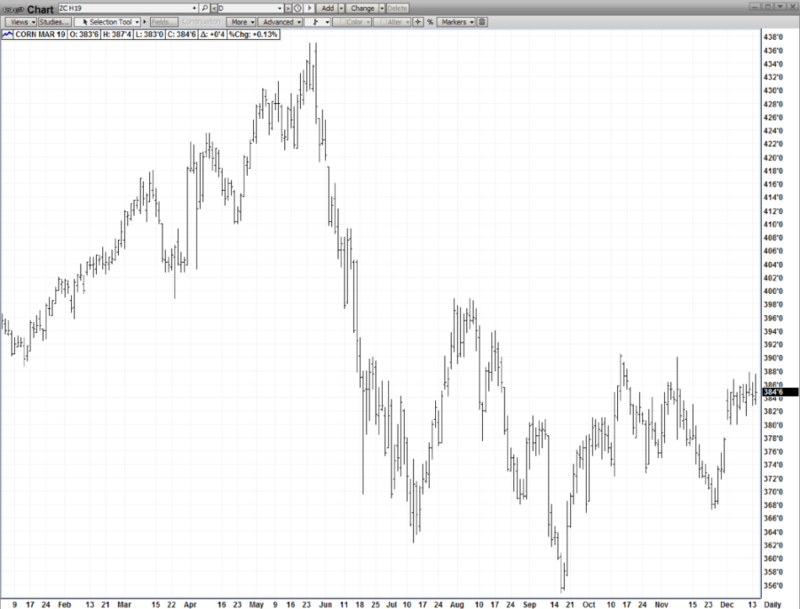 The positive trade rhetoric about China’s eventual interest in our corn would make the staunchest BEAR very nervous!! 3 mmt in Jan and a possible total of 12-15! 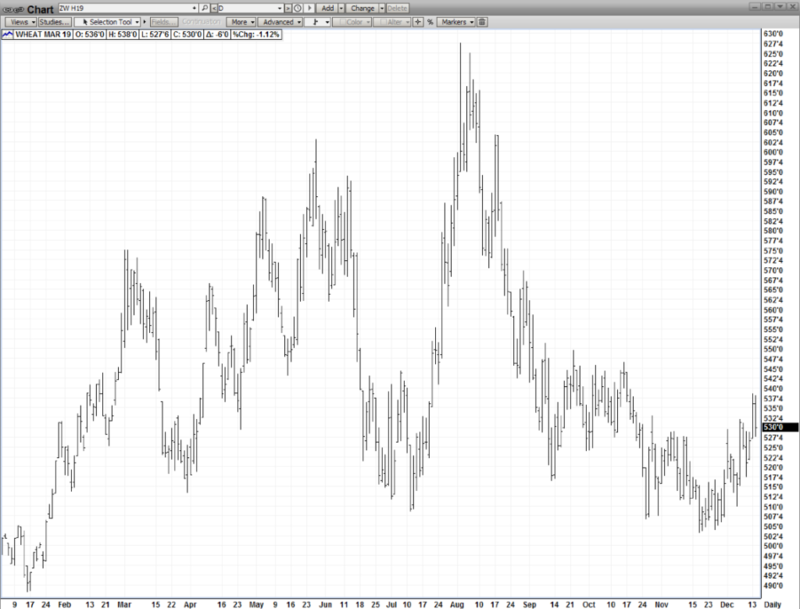 And why not – US Corn is easily the cheapest on the world mkt – as it comes off 10 year lows! The upside gap left on 12/1 is a very powerful technical formation! CAUTIOUS OPTIMISM – for sure going forward – and well deserved! How many times have we heard good news one day – only to be dashed the next by a “negative tweet”! for sure going forward – and well deserved! WHO DOESN’T LIKE BUYING CHEAP? Our trading partners are no different than any of us – everyone likes a deal –and our world-low corn prices are not lost on them! Early on, the trade tariffs didn’t seem to impact the stock mkt but that changed in Mid-Oct when the DJI lost 2800 points in a hurry! That weakness can be attributed to several factors but certainly trade woes were high on the list. So, in our mind, trade resolution is high on Trumps list as his CROWN JEWEL – a vibrant economy – has definitely stalled of late!! Whoever said that Wht is a perennial follower of its “sister mkts” – corn & beans -will need to re-think after this week’s action! 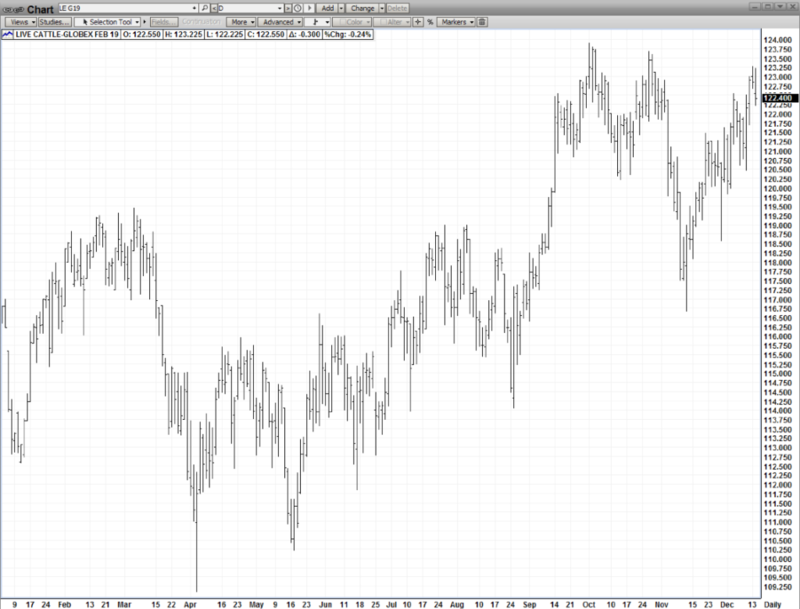 Indeed, Mar wht was the leader – closing unchanged while Jan Beans & Mar Beans slumped to lower closes! While Australia’s drop in exports & Egypt’s tender were positives, the 800 pound Gorilla in the room was the rampant speculation that Russia’s unrelenting export pace was about to slow –and maybe markedly! A Russian Exporter Meeting next week will be closely monitored to see if the export-cutting rumors are really true! Russia’s aggressive export program has long been an Albatross for our wht mkt!! A dry 5-day forecast & a large premium to cash were not enough to hold Feb Cat down, as the contract gained just under a dollar for the week (121.50 – 122.40! Very strong DEMAND was once again the key upside impetus! In a strong economy, beef tend to outperform pork! And give an assist to improved trade talks that promise more beef Exports in 2019! Feb Hogs had very disappointing action this week –culminating in an over $2.00 collapse late Friday (66.75 – 64.50) to finish the week down almost $3.50. Culprits would be a hefty premium to cash & a prodigious short-term supply! Still, longer term, major concerns about the ASIAN SWINE FEVER & a certain boost in pork exports once tariffs are lifted – are buoyant bullish factors that should indeed lift hog prices in 2019! !